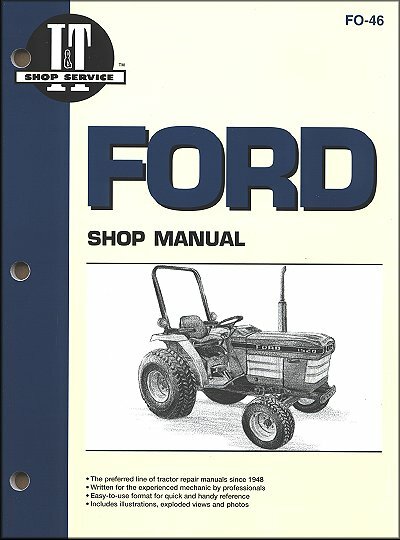 This Ford Tractor Repair Manual covers tractor models 1120, 1220, 1320, 1520, 1720, 1920 and 2120. The manual is written by I&T/Clymer and is geared towards experienced mechanics. The guide follows an easy-to-read format and covers a wide range of topics from tractor repair to maintenance and storage. The professionally-written guide includes tips and tricks to make repairs easier and to keep your tractor running in perfect condition. This Ford manual is a must-have addition to any barn or farm equipment repair center. The manual also includes wiring diagrams for all models listed. The I&T/Chilton manual is available for fast shipping. Most manuals leave the warehouse in just 1 business day and shipping is always free to the continental United States. If the manual isn't exactly what you're looking for, simply return it without a hassle. At The Motor Bookstore we strive for 100 percent customer satisfaction. With engine running at the speed where malfunction is most noticeable, loosen compression nut on high pressure line for each injector in turn, allowing fuel to escape at the nut rather than enter the cylinder. If engine operation is not affected when injector line is loosened, that is the cylinder that is misfiring. If a faulty injector is found and considerable time has elapsed since injectors have been serviced, it is recommended that all injectors be removed and serviced, or that new or reconditioned units be installed. Refer to the following paragraphs 62 through 66 for removal and test procedures. I have an electrical problem with my Ford 1920 Farm tractor. Cranks, runs good, no lights work, fuses (3) check good ? This tractor repair manual covers DIY procedures and troubleshooting for the electrical system of the Ford 1920 and we believe it can help you solve the referenced problem. Ask a question about Ford Tractor Repair Manual 1120, 1220, 1320, 1520, 1720, 1920, 2120. JUST WHAT WE NEEDED. CAME IN QUICK. A good amount of information in a small package not available or difficult to find from other sources. Makes the job easier when you have some guidance. Helps prevent potentially expensive mistakes. Wish there was one for my car. very informative. Manual has good detail pictures. Nice electrical wiring diagram. Why have parts listed that's not in the book. Like hydraulic lift system listed on page 179 but book only has 136 pages. One paragraph saved me HUNDREDS. I own a 1520 Ford Tractor. I lent it to my brother-in-law and on return it was creeping forward, it has a hydro-stat transmission. I couldn't see anywhere to make an adjustment. I found your repair manual and it was delivered in a couple of days. I found the section to adjust centering of the pedal and it was so easy I was over joyed. I could have just as easily brought it to a repair shop and who knows what I would have been charged. Thank you for your excellent repair manual.